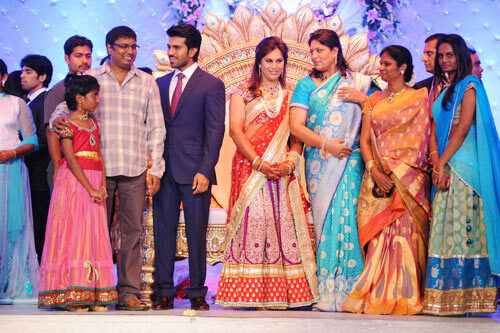 Ram Charan Teja married Upasana Kamineni on the morning of June 14 at the Kamineni farmhouse in Hyderabad. 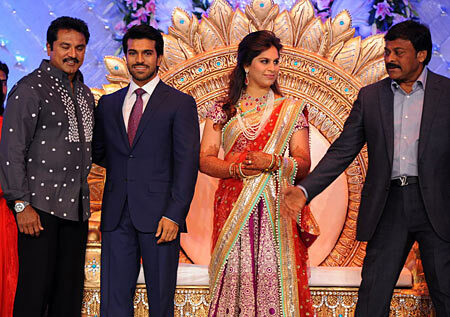 The reception, held in the evening was an extravagant affair with stars like Rajanikanth, Amitabh Bachchan and Nagarjun turning up to bless the new couple. 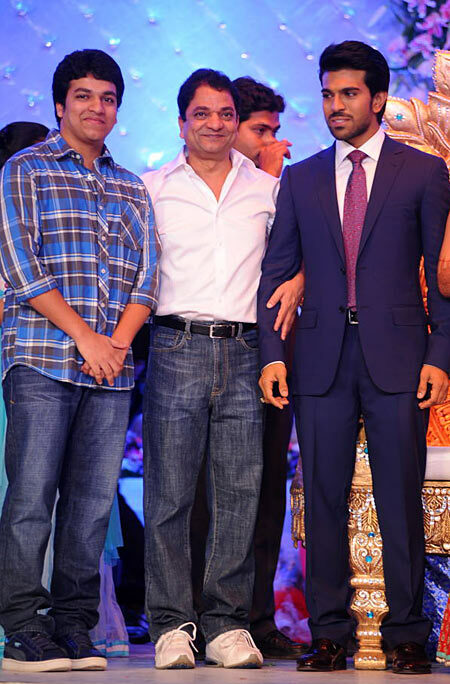 Held at the Hyderabad International Convention Centre, the reception was also attended by Ram Charan's actor friends -- cousin Allu Arjun, Rana Daggubati and many others. Several emiment politicos were also in attendance. 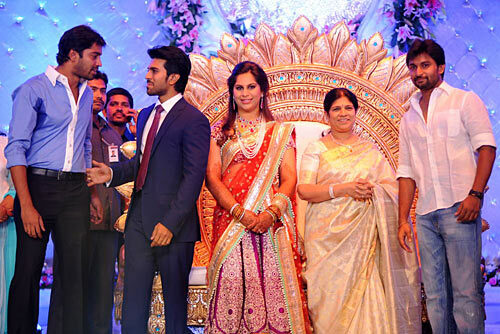 Ram Charan's cousin Allu Arjun and Tabu greet the couple on stage. 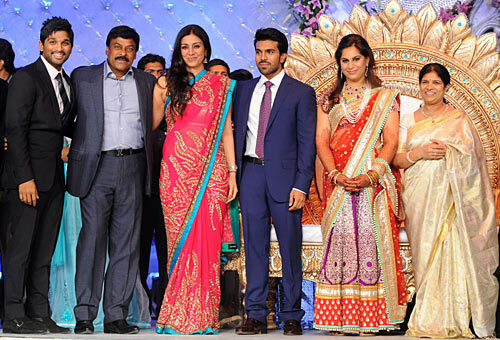 Image: Allu Arjun, Chiranjeevi, Tabu, Ram Charan Teja, Upasana, Surekha. 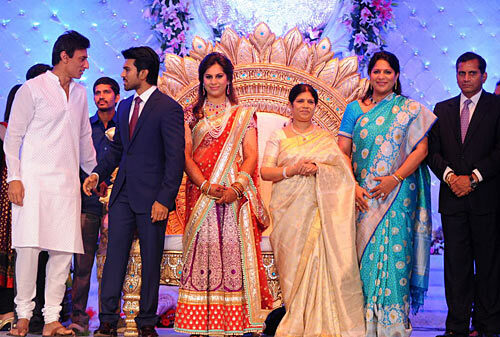 Rana Dagubatti's father producer Suresh Babu wishes the couple. 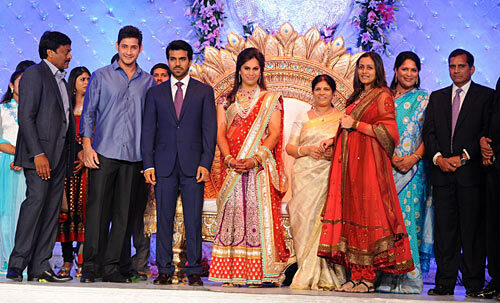 Actor Mahesh Babu and Namrata Shirodkar made a rare appearance to wish the happy couple. Actress and MP Jaya Pradha was also at the do. 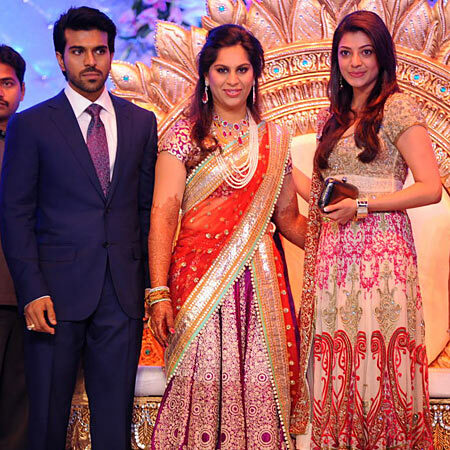 Kajal Agarwal, who starred along side Ram Charan in Magadheera, was also present. 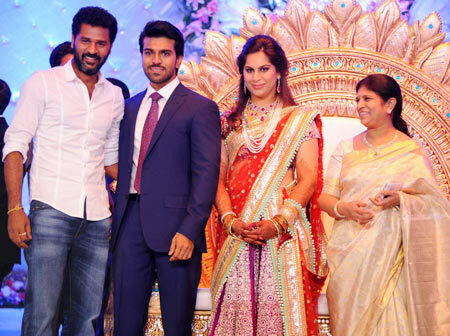 Prabhu Deva, who has signed on Ram Charan Teja for his next project also graced the occasion. 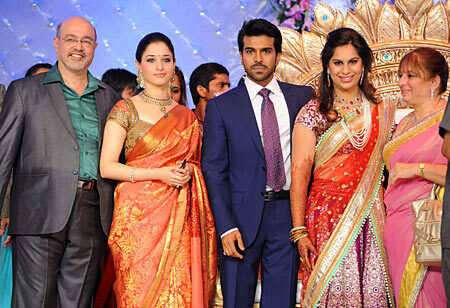 Tamannaah arrived with her parents Santosh and Rajani Bhatia for the reception. Actor Siva Balaji poses for a picture with the couple with his wife Madhumita. 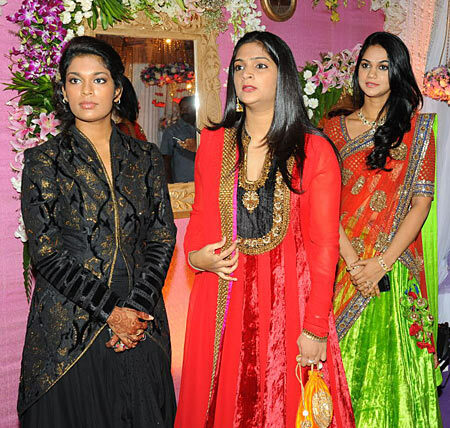 Ram Charan Teja's sister Srija (in black) was spotted with the guests. R Sarathkumar greets the couple. Actor Rahul Dev was in coversation with the groom as the group posed for pictures. 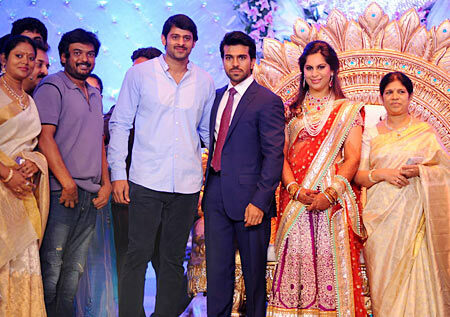 Director Puri Jagannath and actor Prabhas pose pose with the new couple. Prabhu Deva's brother, dance director Raju Sundaram attends the reception. 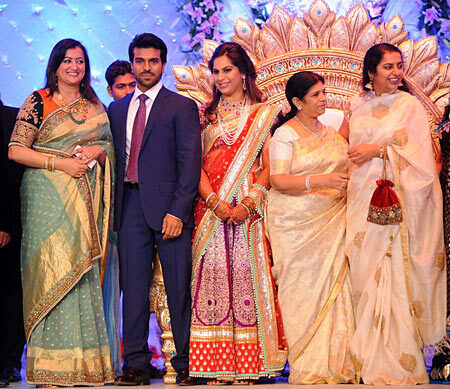 Chiranjeevi's colleagues Sumalatha and Suhasini Mani Ratnam were also present. 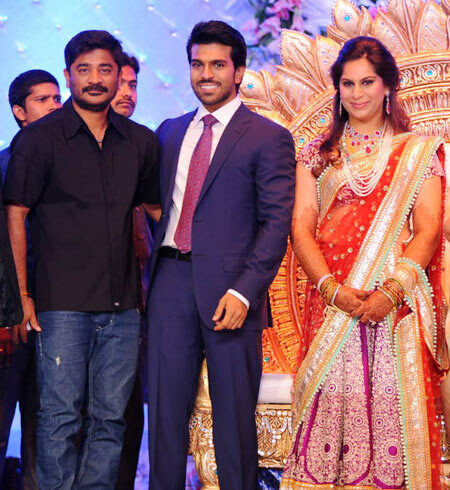 Director G V Sudhakar Naidu poses for a picture with Ram Charan Teja and Upasana. 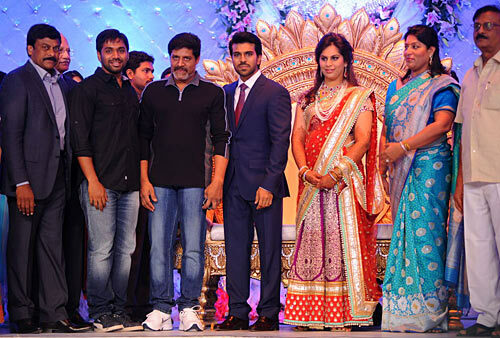 Chiranjeevi welcomes Tamil character actor Satyaraj. 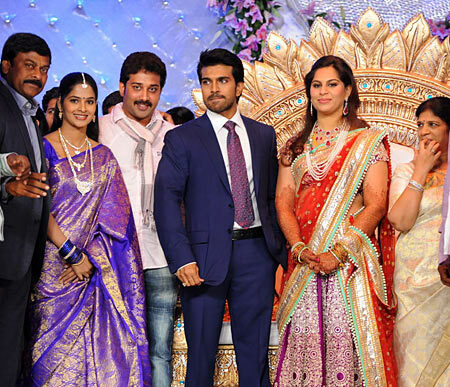 Director Srinu Vytla greets the couple on stage. 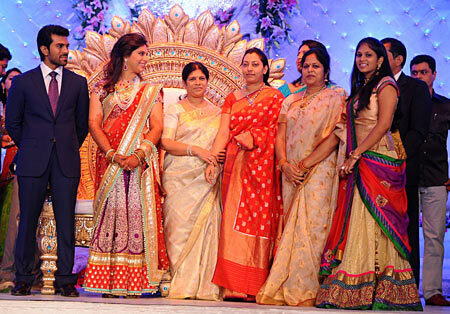 Actor Balakrishna's wife Vasundhara (in red saree) poses along with other guests. Director Gunashekhar arrived with his family. 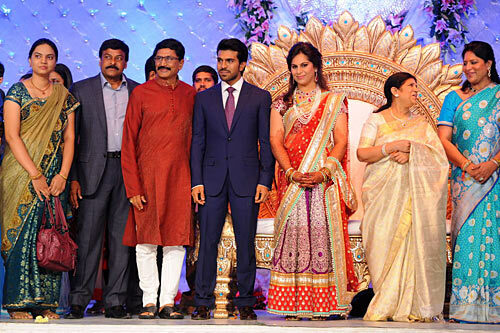 Producer/actor Murali Mohan was also spotted with his family. 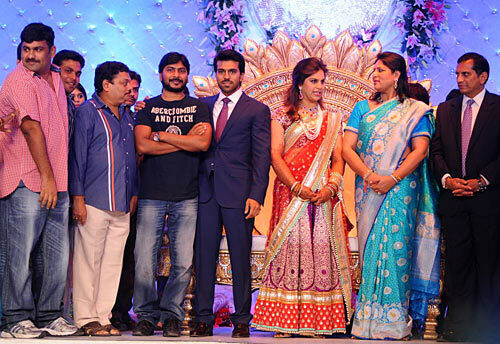 Director Sampath Nandi (in black t-shirt), who worked with Ram Charan Teja on the film Racha, also turned up at the do. 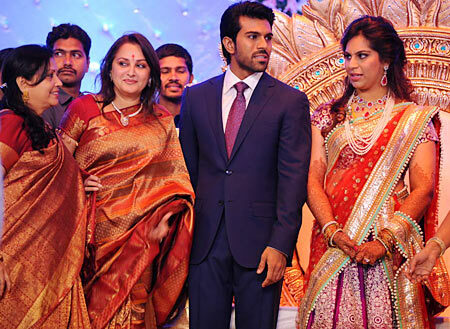 Actors Naresh and Nani along with Ram Charan's mother Surekha. 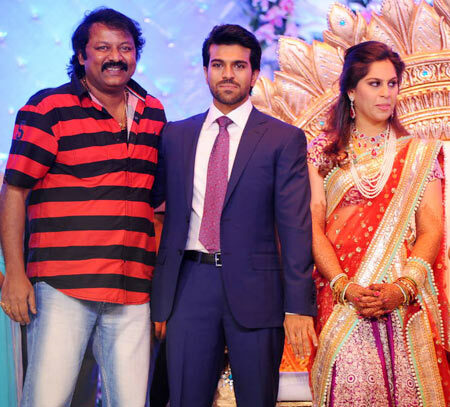 Ram Charan's co-star Srihari from Racha was also among the guests. Director K Vijaya Bhaskar along with his son. 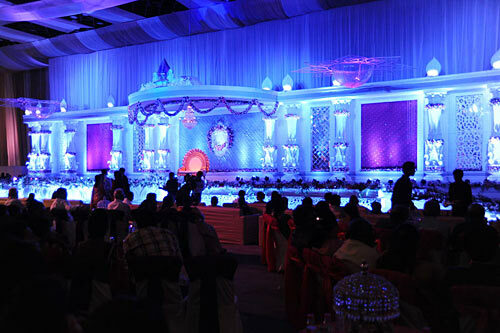 The reception hall was done up in blue lights.